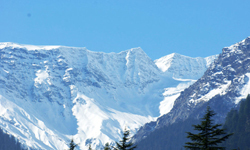 There is great diversification in the climatic conditions of Himachal due to variation in elevation (450-6500mtrs). It varies from hot and sub-humid tropical (450-900mtrs) in the southern Low tracts, warm and temperate (900-1800mtrs), cool and temperate (1900-2400mtrs) and cold alpine and glacial (2400-4800mtrs) in the northern and eastern high mountain ranges. The year is divided into three seasons. Cold (October to February), hot (March to June) and rainy (July to September). By October, nights and mornings are very cold. Snowfall at elevations of about 3000mtrs is about 3mtrs and lasts from December to March. About 4500mtrs, is perpetual snow. The main season is the spring from mid- Feb to March-April. The air is cool and fresh. Colourful flowers adorn the valleys, forest slopes and meadows. In the hill stations, the climate is pleasant and comfortable. The rains start at the end of June. The entire landscape becomes green and fresh. Streams begin to swell and springs are replenished. The heavy rains in July and August cause damage to erosion, floods and landslides. Dharamsala has the highest rainfall of 3400mm. Spiti is the driest area (below 50mm rainfall) being enclosed by high mountains on all sides.